Pakistan have gone in with an unchanged 16-man squad for the first Test against New Zealand, following their hugely successful series against Australia. Chief selector Moin Khan said this was done with a view to promote stability within the team and help it build consistency. 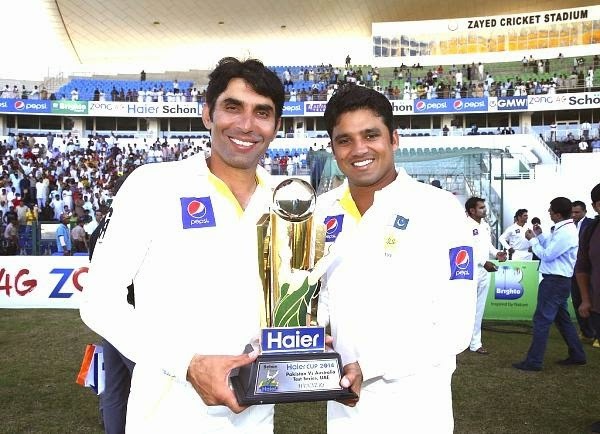 "We're proud of Team Pakistan's achievement in the series against Australia," Moin said. "It was a heroic performance ... but we need to put this success behind us for the moment and switch our focus on the series against New Zealand. It will be a fresh start and will need to keep the momentum going. "There is no change to the side from the Abu Dhabi Test against Australia. This is to ensure there is consistency, which will bring more stability and strengthen team bonding and combination." Pakistan had swept the two-Test series against Australia to register their first Test series victory against them in 20 years. They were massive wins too, by 221 and 356 runs. Pakistan beat Australia for the first time since 1994 and chief selector, Moin Khan, said it was imperative to be consistent with the selection process. "This is to ensure there is consistency, which will bring more stability and strengthen team bonding and combination. There is no change to the side from the Abu Dhabi test against Australia as we wanted to ensure there is consistency," Moin was quoted in a Pakistan Cricket Board release. The first Test against New Zealand begins on November 9, and is followed by two more Tests, two T20s and five ODIs. Squad for first Test against New Zealand: Misbah-ul-Haq (captain), Ahmed Shehzad, Azhar Ali, Asad Shafiq, Ehsan Adil, Haris Sohail, Imran Khan, Mohammad Hafeez, Mohammad Talha, Rahat Ali, Sarfraz Ahmed, Shan Masood, Taufiq Umar, Yasir Shah, Younis Khan, Zulfiqar Babar.